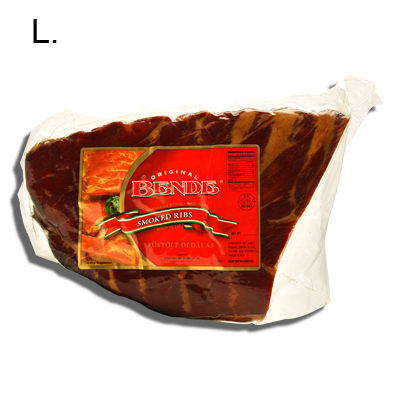 SMOKED PORK RIBS - ($5.99/LB) | Bende Inc.
Bende Hungarian Brand Smoked Pork Ribs, "Fustolt Oldalas", Ready to Eat, Vacuum Packed, Approximately 1.0 lb, Average cost per package $5.99 (1.0 lb x $5.99/lb = $5.99), Product of USA, The ribs are prepared and cured with a salt base rub and smoked. Although this product is safe and "ready to eat", most people would find it too chewy and salty to eat out of the package. For best results use the ribs in preparation of traditional European foods in which it cooks to perfection and complements, for example, sauerkraut or bean dishes. When preparing these dishes with the ribs, no addition of salt is likely needed.